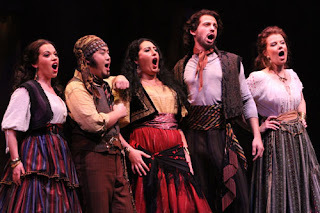 Amanda Opuszynski, Andrew Stenson, Anita Rachvelishvili, Sarah Larsen, and David Krohn, in Seattle Opera's current production of Carmen. Aside from featuring familiar faces and exciting debuts, our production of Carmen also spotlights several of our talented Young Artists, who will spend the 2011/12 season preparing for a career in opera with two of their own productions (the fall Young Artists Program tour of Werther kicks off next month, and they tackle Don Pasquale in the spring), as well as select mainstage roles. Today we speak with those YAPs making their mainstage debuts: baritone David Krohn (Dancaïre), soprano Amanda Opuszynski (Frasquita), baritone Joseph Lattanzi (Moralès), and mezzo Sarah Larsen (Mercédès). 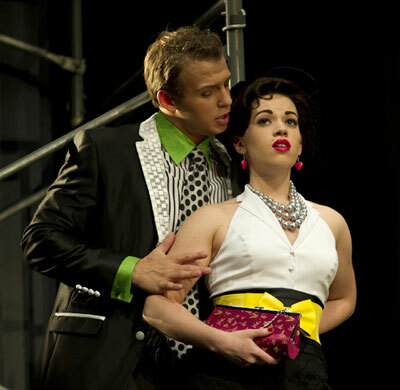 David Krohn (Don Giovanni) and Amanda Opuszynski (Donna Elvira) in the Seattle Opera Young Artists Program production of Don Giovanni last season. Amanda, last spring you sang Donna Elvira in the YAP production of Don Giovanni. Here, you’re in a supporting role—although your high C is a prominent part of many musical numbers in Carmen. What are challenges and opportunities associated with this kind of role? Amanda Opuszynski: One of the best parts of the Young Artists Program is that we get the opportunity to perform in both the YAP productions and the mainstage productions. While there's much to be learned in singing leading roles with the YAP (and it's certainly fun to be in the spotlight singing arias), mainstage roles give us a chance to learn from our more experienced colleagues. We can observe the way they work onstage and off, and it's very inspiring and exciting! I think we all hope to be in their shoes one day, and it's advantageous to learn now what the expectations will be. Of course, we supporting characters also have some wonderful music to sing! There are so many fantastic ensemble and individual featured moments. I suppose the challenge would be to put as much effort into character development in these supporting roles as we would if we were the leads, but with such feisty, passionate characters, that’s half the fun! 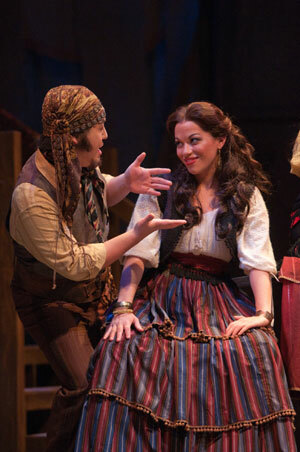 Amanda Opuszynski (Frasquita), with fellow Young Artist Andrew Stenson (Remendado) in Seattle Opera's production of Carmen. 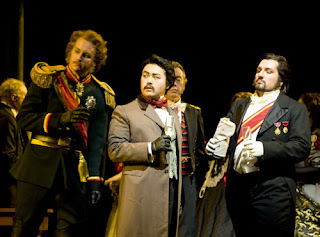 Stenson made his mainstage debut last season as Arturo in Lucia di Lammermoor. Andrew Stenson (center, as Arturo) in Seattle Opera's 2010 production of Lucia di Lammermoor. Joseph, what kinds of things can you learn from being in a show with stars like these Carmens and Josés? Joseph Lattanzi: There are so many things young singers can learn from seasoned professionals but first and foremost, they are just truly amazing to be around. I was sitting next to one of the Carmens on the first day of rehearsal and was immediately struck by the way that sound just emanated from her. Singing seemed so easy and so natural for her, and as a young singer that is something I aspire to—to one day have a beautiful, vibrant sound that feels like second nature to me. These stars, in particular, seem genuinely nice and that is a great example to set for a young singer, as well. It's inspiring to see kind, hard-working people with good personalities and generous spirits having so much success in the opera world. It creates a positive atmosphere to work in and makes the whole process much more fun. Joseph Lattanzi (Moralès) and Sarah Larsen (Mercédès) in Seattle Opera's production of Carmen. Sarah, are you learning Carmen’s arias? Do you hope to sing the lead role in this opera someday? Sarah Larsen: The Seguidilla and the Card Aria are in my current repertoire, and I am working on the Habanera right now. The role of Carmen sits lower than most of my repertoire, and it allows me to really focus on creating a good technical foundation for my lower middle range, which can only help my high notes! Every mezzo aspires to sing Carmen, and I have to admit that I do as well. However, I think I still need a few more years to grow into my voice and tap into the character. She is quite complex, both musically and dramatically, and I need a bit more time to thoroughly explore her. Sarah Larsen (Mercédès) and David Krohn (Dancaïre) in Seattle Opera's production of Carmen. David, in a few days we'll get to hear (and see!) more about your summer adventures. But can you whet our appetites for the story of your trip? Keep your eyes on our blog, because we'll hear more from David soon...with full details of his adventures in Italy!